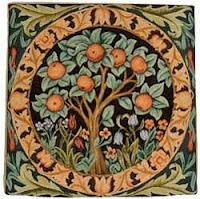 A beautiful bell pull inspired by William Morris's "Tree of Life" pattern is available from English Heritage, as are cushion covers in "Tree of Life" and "Orange Tree" (shown here). I also love the "Crown" zip purse and pincushion. The Watts Gallery in Compton offers The Lady of the Rocks, a small, nicely detailed sculpture based on the figure of Eve in George Frederic Watts's oil painting Eve Repentant (1897). The Gallery also carries a wide range of books, prints, and cards relating to Victorian art, architecture, and design. If Millais is more to your taste, you're in luck. In conjunction with Tate Britain's blockbuster exhibition on the artist, all sorts of things Millaisian are available, from an artist's pen wrapped in an image of the drowned Ophelia to a rather beautiful scarf with a cut-out leaf pattern at the ends. Plus, of course, the requisite fridge magnets, notebooks, shopping pads, books, and CDs. 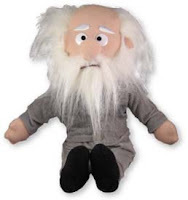 The life and work of Charles Darwin has inspired a wide array of items that would make excellent gifts. From the Unemployed Philosophers' Guild comes an 11" doll (shown here) and a cute die-cut greeting card. Young naturalists will love the large plush Galapagos tortoise from The Jungle Store and the Bug Box from English Heritage. 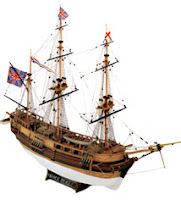 Seagifts.com offers a 26" wood model ship kit of HMS Beagle; if your manual dexterity leaves something to be desired, you can commission a custom-built replica of the ship instead. Better yet, make a gift in your own or someone else's name to the HMS Beagle Project, which will launch a sailing replica of the ship in 2009 to mark the bicentenary of Darwin's birth. The replica, crewed by scientists and sailors, will retrace the 1831-36 voyage of the original Beagle. You can buy shirts, mugs, tote bags, buttons, and stickers at the Beagle Project's website. Speaking of ships, the Cutty Sark conservation project continues at Greenwich in the wake of last May's devastating fire (read my post of May 21 describing the fire here). The Cutty Sark was a British merchant sailing vessel built for the lucrative nineteenth-century tea trade with China. The Cutty Sark Trust's online shop offers a number of items that would make brilliant presents, including a captain's mug inspired by the original dinnerware used on board the Cutty Sark; a key fob made with metal from the original Cutty Sark foremast of 1869; bone china mugs, night lights, and pill boxes; glass paperweights and leather coasters; handcrafted Irish leather purses emblazoned with the iconic Tudgay painting of the ship; and pirate shirts for the kids. You can also support efforts to save the ship by making an online donation. 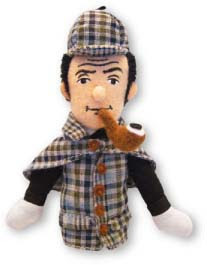 The aforementioned Unemployed Philosophers' Guild offers several 4" finger puppets/refrigerator magnets of interest, including Darwin, Charles Dickens, Sherlock Holmes (shown here), Karl Marx, and Virginia Woolf, as well as Muppet-like dolls of Holmes, Marx, Woolf, and Oscar Wilde. For Lewis Carroll fans, there's a Cheshire Cat mug (the grinning tabby disappears when you fill the mug with hot coffee or tea); Alice's "Enchantmints," which are packaged in an illustrated tin; a Mad Hatter pill box, and die-cut Alice, Mad Hatter, White Rabbit, and Queen of Hearts greeting cards that come with sheets of stickers (you can also buy all of these together in a set of eight). Know someone fascinated by Victorian taxidermy? The legendary Paris shop Deyrolle (depuis 1831!) is an Aladdin's cave of goodies. Start with their four-page "Cadeaux de Noël" listing, then poke around the "Animaux Naturalisés" section. 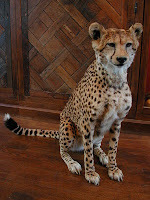 For a mere 26000 €, you can have this cheetah, magnificent scourge of British settlers in colonial Africa. (Or perhaps, madame, you would prefer the pair of baboons, which could be even more troublesome, non?) Deyrolle is also your source for beautifully painted ostrich eggs; exquisite notebooks and playing cards decorated with nineteenth-century prints of fish, giraffes, and orchids; bags of exotic shells from around the world; bird-calling instruments; and everything you could possibly need to organize your own (comparatively pathetic, je vous assure) butterfly collection. In the "dream on!" 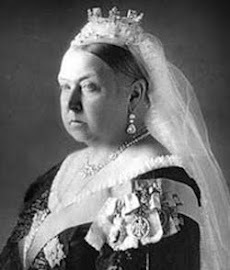 category, how about autographs, manuscripts, and letters by Prince Albert, Lewis Carroll, Robert Browning, Elizabeth Barrett Browning, Lord Alfred Douglas, George Eliot, William Holman Hunt, Henry Irving, Edwin Landseer, Samuel Plimsoll, Arthur Rackham, Algernon Swinburne, or Ellen Terry? All are available from the venerable Maggs Rare Books in London. If it's a first edition of Dickens's Oliver Twist you're after, try Ash Rare Books, also in London. Prefer brooding sociopaths to workhouse waifs? For works by the Brontë sisters, you'll need to keep a keen eye on Sotheby's and Bonhams (not to mention your bank balance); the latter just sold a first edition of Emily's Wuthering Heights for £114,000. The Brontë Parsonage Museum and Brontë Society online shop offers affordable, unusual jewelry based on drawings by Charlotte and on wallpaper used in the Brontë home, as well as a good selection of books, posters, postcards, and CDs. It even has counted thread cross stitch sampler kits based on samplers worked by Charlotte, Emily, and Anne when they were children. Need a special gift for a steampunk aficionado? Try the "Steampunk Gift Guide" at Make, where you can find mechanical trilobites, cog earrings, leather bib aprons, steam engine kits, and a "make-your-own-Edison phonograph" kit. Very cool stuff. 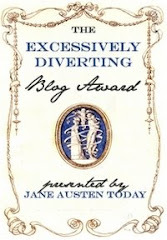 And over at Pre-Raphaelite Sisterhood, blogger Stephanie Pina has provided her own list of gift ideas for PRBphiles. I have the Christmas spirit of an unreconstructed Ebenezer Scrooge, but your gifts columns seem to have put me in a holiday mood. Hi, Sid ... I'm so glad! Happy holidays!